The chestnut trees are members of the beech family (Fagaceae). This family of trees, which also includes the oaks, contains hundreds of beautiful species of nut-bearing trees. Many of these are economically valuable for their timber in addition to being prized as specimen plantings in the landscape. For purposes of our discussion on this page, we will look primarily at the American chestnut tree (Castanea dentata). Once widely spread throughout forests of the eastern United States, this tree is known now as the species that almost didn’t survive. The huge fast-growing trees (exceeding 100 feet in height) were plentiful and valuable when they were attacked in the early 1900’s by a devastating blight that was accidentally introduced from Asia. The blight spread quickly, killing huge numbers of the American chestnuts over almost their entire native area. Today, some stock (re-grown primarily from the roots of surviving stumps) still exists, and chestnut seedlings can now be ordered and planted into your landscape if you so choose. The bark is of a darkish gray-brown color, and the growing tree assumes a spreading form with several horizontal-growing branches that give the chestnut tree its characteristic open crown. The deciduous tree produces beautiful dark green leaves (5 to 7 inches long) in the spring followed by attractive flowing catkins of a lighter greenish-yellow coloring. 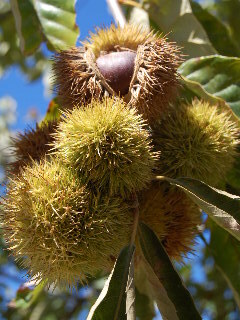 The nuts of the chestnut tree are enclosed in prickly burs that are green in color until the fruit ripens, at which time the burs turn brown and begin to dry and burst open. The opened burs reveal usually 2 or 3 chestnuts inside each pod. The burs are up to 3 inches in diameter and the nuts are about 1 inch in diameter. Each nut is enclosed in a brown shiny hull that is easily opened by a light crunch of the teeth, either by humans or by some other hungry creature such as a squirrel or deer. The whitish edible nut itself is sweet tasting and a delight to whichever creature is lucky enough to find it first. 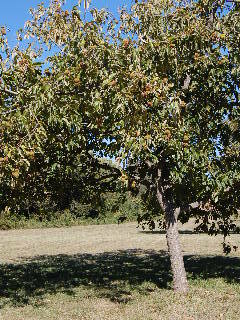 Some hybrid chestnut trees have been produced by crossing the American chestnut with other varieties, particularly the Chinese chestnut. Thankfully, we still have living specimens to remind us of the formerly magnificent stands of American chestnut trees that once provided so much timber for housing and food for wildlife.